Prizes: Monthly Prizes: The certificate will be awarded for one cartoonist only. The Monthly Prizes will be awarded from May 2007 to Jan 2008. Remark: only the best cartoons will be published and may be used for promotional purposes; cards, posters, newspapers, catalogs, books, etc. Participants are considered to have accepted all the conditions and are aware that their submitted works may be reprinted and used without permission. WittyWorld is conducting a worldwide survey on the "The Image of America"
WittyWorld is conducting a survey of international perceptions of the United States, its influence, culture, and people. Cartoonists and artists are invited to offer their own version of opinions. A balance of views (positive and negative) is preferable, although the study is not necessarily looking to achieve that. The main goal is to mirror true images of how the world sees the U.S. as a whole — not only the present Bush Administration. However, all submissions, regardless of their points of view, will be considered and evaluated. We are looking for visually exciting art directly addressing the complex image that the United States emanates to the rest of the world. An example (by Davor Trgovcevic, Croatia) is provided within this announcement. Dr. A. William Menzin, a Harvard psychiatrist with a long-standing interest in using political cartoons for gauging social attitudes, is a strong supporter of the project and is advising and cooperating with WittyWorld founder Joe Szabo, who is writing a book. A broad selection of the finest submitted examples will be the highlight of this study, while a traveling exhibition is also in the planning. Although high quality reproductions and electronic versions are also accepted, for the purpose of the show, original cartoons are preferable. We have received wonderful submissions, however the deadline has been extended until further notice to allow for a broader geographic representation of opinions to come in while the book is being written. There is no limit as to how many cartoons/art may be submitted, but the size of the images must be at least A4 (21X30 cm). Original artworks should be sent to WittyWorld, 214 School Street, North Wales, PA 19454, USA. Electronic submissions (must be in high resolution — minimum 300 dpi and in either .tif or .jpg format) and inquiries should be sent to editor@wittyworld.com. Format: 8.5" by 11" (21.59 x 27.94 cm) maximum. Black & White. Entry & Fees: Must be postmarked by July 15th, 2007. US residents 17 and older = $5.00 for each cartoon (Check or cash). Youths 16 and younger are free. Non-US entries are free. Prizes: We offer First Place, Second Place, Third Place, an Honorable Mention, and a Public’s Choice award — all certificate prizes. Monetary prizes are only applicable for First, Second, and Third Places for USA residents 17 and over (the only group required to pay for entry). Cartoons will be displayed in an exhibit at Homer Davenport Days (Aug. 3rd thru 5th). 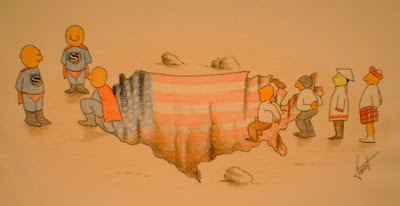 It is local tradition for winning cartoons to be published in the local newspaper, and we now post winners on our web site (davenportdays.com). For future festivals, we would like to post certain cartoons that still have topical merit; these are not in competition and not posted near competing cartoons. We will contact you prior to the festival to secure your permission to do this. In all cases, your name and state/country will be clearly labeled. Can participate: painters, photographers, printers, humorists, etc. until August the first 2007. Prizes: 1st, 2nd, 3rd and one mention will be awarded in the following categories: Graphic humor / illustration / painting / digital art / popular naïf art / drawing / photography (monochrome or color up to 6 per artist). 36 works of art: 8 paintings, 8 sculptures, 8 engravings, 8 drawings from great masters of painting from Mercosur will be awarded valuated in 5000 US dollars. Cost: 50 Us dollars will be changed to participant artist to pay edition of brochure, packing/transportation in returning works, send fee by Foundation Cultural Volpe Stessens, cuenta corriente Bank Frances Nº 012-009379-9 - Buenos Aires – Sucursal Parque Patricios /Jorge Volpe DNI 12087670, Caseros 2739, CP 1246. In case of not sending the money asked works will be considered a donation to the Volpe Stessens Foundation to become a part of the acerbity of the Itimuseum / Diògenes Taborda Museum / Paillet Museum or to be given away to some public welfare institution..
director of the Volpe Stessens Cultural Foundation. 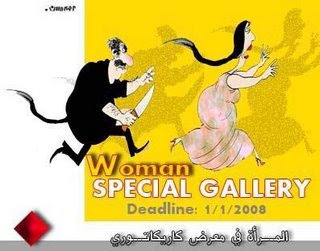 Themes: Naji Al Ali – Caricature & cartoon. A: Palestinian Cartoonist, B: Palestine. 1- Each cartoonist can submit a max of 6 works. Original and made by computer will be accepted: black & white or colored. 4- On the back of each work the following information should appear: First name - surname - address - tel & fax - e-mail – theme section & title. 5- NOTE: entry- form is necessary. 6- The works will be displayed at Syria Cartoon website: http://www.syriacartoon.com/ or may be used for promotional purposes; cards, posters, newspapers, catalogs, books, etc. Participants are considered to have accepted all the conditions and are aware that their submitted works may be reprinted and used without permission. 7- All entry works must not be submitted as neither folded nor rolling form. 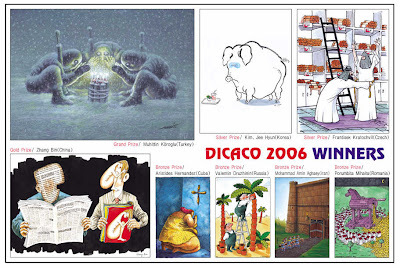 9 - All the cartoonists whose works will be selected for the exhibition will receive a catalogue. 10 - The prize winners will be informed by mail. 11 - The results will be declared in August 2007. 12- PRIZES: Golden prize, Silver prize, Bronze prize, special prize: all selected works will be awarded. 13- All awards are subject to necessary adjustment. Please check web bulletin. 14- By submitting the works, the author accepts the rules and regulations of the Contest and the decisions of the Jury. 1. The Biennial for Caricature is open to professional and amateur caricaturists from all over the world. 3. 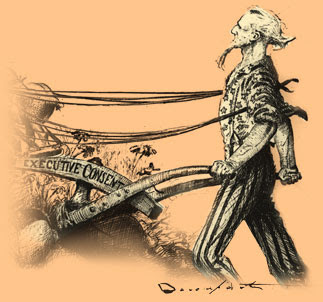 The caricatures may be in color or black and white. 5. It is recommended that in addition to their caricatures, participants also send a photograph and CV. 6. 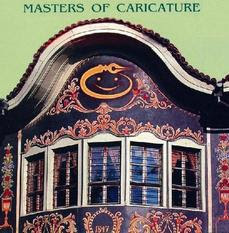 An international jury will nominate 5 caricatures who will be conferred the title "Master of Caricature". 7. Prize-winning caricatures are not returned. 8. The rest of the caricatures will be sent back if artists state their desire in written form. 9. The catalogue of the exhibition will be given, free-of-charge to winners and those included in the catalogue. REGISTRATION: until July 13, 2007. 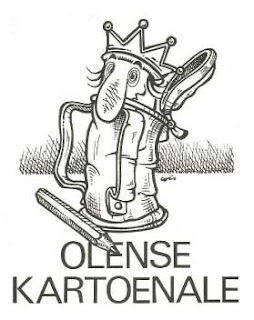 All professional or amateur cartoonists may register new humor works that have not received prizes in other shows, until up to the event subscription closing date (July 13, 2007). Each author may register up to 2 (two) works per category. Any works developed in any technique will be accepted. VANGUARD – Graphic humor translated into forms that do not follow previous standards, but are presented as a cardboard presentation, in A3 (297 x 420mm) format. Works that did not comply with these dimensions will be automatically disqualified. If the prize jury finds any type of fraud or illegal use in one or more registered works, it may cancel the awarded prize. The awarded works will be divulged on the Humor Show’s webpage after inauguration of the same, and may be contested until one week after the Show’s opening, with the applicable evidence of any irregularities committed without the jury’s knowledge. Other prizes and mentions may be instituted, at the discretion of the Organization Committee. Deadline: July 13, 2007 (postal date will be valid). Works will be returned until 1 (one) year after closing of the event on October 14, 2007. If the artist wishes to receive his/her work before that date, he/she must request it at ‘Centro de Pesquisa de Divulgação Nacional de Humor de Piracicaba’, at the above mentioned address. When registering, the author transfers the Assignment of Author’s Rights relative to his/her Work(s) when awarded on an acquisitive basis, in conformity with Law 9610 of February 19, 1988 (Copyright Law) on a full, universal and definite basis, in all utilization modes and on a complimentary basis, the author’s rights, safeguarded by the said law, relating to the work(s) awarded in the Piracicaba International Humor Show, becoming an integral part of the Municipal Public Heritage for all intents and purposes, in conformity with Municipal Law 2249 of 1976, partially altered by Municipal Law 2486 of 1982, and consolidated by Municipal Law 5.194 of 2002. 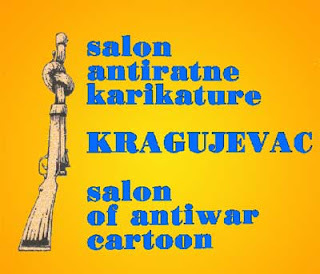 The cartoonists and fine artists from all over the world are invited to take part in the salon. The applicants should submit the maximum of 3 (three) original works on the antiwar topic and understanding and solidarity among the people, which are not been previously awarded on some other international competitions. The dimensions of works should be maximum 35x35 cm, art technique is at the choice of the artist. Also, electronic form with original signature of the author should be submitted. On the back of all the cartoons should be written the personal details about the author: name, surname, address, phone/fax, e-mail. The Daejeon City is inviting world cartoonists to take part in DICACO 2007 (the 16th Daejeon International Cartoon Contest). 1.This year's contest comprises a Theme section (titled Relief & Service) and a Free section. 2.The size of works should be smaller than 297mm x 420mm. 3.Any color, free style, and unlimited items. 4.Each entrant should provide title, name, age, address, career, and telephone number on reverse. 6.Entries should be addressed to the Daejeon International Cartoon Institute, 450, Wolpyongdong,Daejeon city, 302-852, Seoul Korea. 7.The most creative cartoon will win the Grand Prix prize of $3,000, Gold prize of $1,000, Silver prize of $500, Bronze prize of $300, and 100 Selected works will be awarded. 8.Exhibit the cartoons at the Daejeon Hanbat Library Gallery in Sept. 2007. 9.Submitted cartoons will not be returned, but exhibited forever in Korean public halls, art galleries, & museums. 10.Your cartoon may be used for promotional purposes: card, posters, catalogs, newspapers, magazine, and books etc. From : Cheong San Lim, Ph.D. Professor of the Daejeon International Cartoon Institute, 450,Wolpyongdong, Daejeon city, 302-852, Seoul Korea. 4-1) The works whether they have been awarded in other contests previously will be accepted. 4-2) Participators should summit the original works. Any slide, photograph or xerox will not be accepted. 4-4) The maximum size of the works should be 300 x 420 mm(11.81 x 16.54 inch) respectively. 4-5) The works should be accompanied by the author's resume and photo (caricature). 6-2) The Opening of the exhibitions will take place in "Master" Illustrators's House on December,2007. 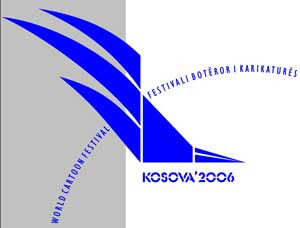 8-3) Biennial will announce the result on November,1, 2007 on web site. At the same time organizer will contact the winning artists via postal mail or email. 9-1) Grand Master prize –Master Cup plus 2000 US Dollars (after tax).The winner will be invited to Beijing for ceremony and one week holiday, the organizer will cover the traveling ticket and hotel. 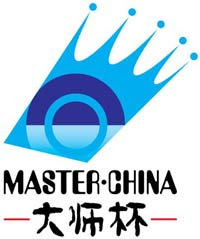 9-2) "Master" Illustrators's Federation prize –Master Cup plus statuette.The winner will be invited to Beijing for ceremony and one week holiday, the organizer will cover the traveling ticket and hotel. The authors whose works has been selected will receive one copy of the catalog made for the contest. The theme is “007, espionage and detectives”. Return of the cartoons happens only on explicit request of the participant. In that case the return of the works will take place at organizers’ cost approximately six months after the ‘deadline’. The organizers will endeavour to handle the return forwardings with the utmost care but cannot be held responsible for loss or damages. The deadline is 23 September 2007. The Valencian Journalists Union (Unio de Periodistes Valencians - UPV) organizes the 2nd EXHIBITION OF GRAPHIC HUMOR in collaboration with FECO-Spain and with the sponsorship of Caja de Ahorros del Mediterraneo (CAM). The aim of this exhibition is to emphasize how important graphic humour is to freedom of expression. 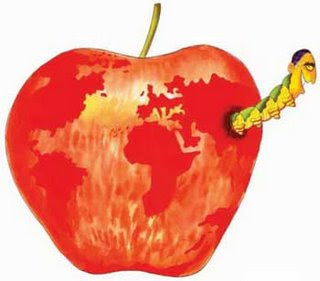 Graphic humour is a journalistic genre highly charged with denunciation and civic compromise, which contributes to the reflection and to the action, waking up consciences with a smile against the depredation of the Earth. 1. Theme: THE EARTH IN DANGER. A health world is possible. We can't continue with the gas emanation which is destroying the ozone cape, the urbanite depredation, the contamination of the water, the sea temperature increase, the billions of refuses, the unlimited water waste, the indiscriminate burning forests and the reduction of the species and flora. 2. The concourse is open for professionals and amateurs. 3. Deadline is the 15th of September 2007. 4. A Jury of qualified experts will make a selection of the works which have been submitted. 5. The selected drawings will be exhibited at the "La Llotgeta Exhibition Hall" of the CAM in Valencia, between 6th till 29th November 2007. The exhibition will be continued by travelling to different cities. 7. Maximum number of entries is 3 works, black & white or coloured, without text. Any kind of style and any kind of technique will be accepted. 8. Every drawing must be signed with the following information on the back side of the cartoon: name, address, phone & fax, e-mail, and title. 9. The Drawing must be original. Digital Drawing will be accepted with the signature by the authors, but not copies of them. 10. Once the exhibition has finished the drawings will be returned to their authors, but not the digital version. 11. Catalogue: A catalogue will be edited with all the cartoons that have been selected. Each author will receive one copy of this catalogue. 13. It will be indispensable to add the inscription to the drawings and a short curriculum vitae. 14. The organizers assume no responsibility for damage or loss of any entry for reasons beyond our control. 15. The drawing can be given free for the organization of the Exhibition to be part of an International Documental Found of Graphic Humour, which will be started by this 2nd Exhibition by the Valencian Journalists Union and FECO-Spain. The authors, who wish to be part of this Found, must express their authorization in the inscription. The Found's Objective is the organization of a touring exhibition, the publication of catalogues and the foundation of an international documental archive about the graphic humour where the author rights and intellectual property will be respected. 16. Accepting these rules means the cession of the author rights to the organization, only for the advertising of the exhibition, the edition of the catalogues and for the travelling exhibition. Reproducing the selected works will have no cost for the organization, since the catalogues and the travelling exhibition won't have any lucrative purpose.